Companies that have steadily climbed up the rankings' ladder to take on the big boys. Even as the global financial crisis, corporate scandals and general uncertainty are slowing down the Indian economy as well as the performance of corporate giants, a bunch of companies has been slowly climbing up the rankings by market capitalisation. They are the Challengers, companies that improved or maintained their BT500 rankings every year between 2007 and 2011. Even if their market caps fell in absolute terms in a particular year, their rankings did not. A rigorous sift through the BT500 list shows only seven made the grade: Adani Enterprises, Exide Industries, Shriram Transport Finance, Opto Circuits (India), IndusInd Bank, South Indian Bank and McLeod Russel India. Each took a different approach to keep rising. McLeod Russel acquired tea plantations in Africa, Exide Industries got into smelting to save on cost of lead, South Indian Bank expanded in new markets and Adani Enterprises gained from the general rise in demand in its three businesses: coal, power and ports. A number of them faced major challenges. Ask Romesh Sobti, the 61-year-old Managing Director and CEO of IndusInd Bank, which has leapfrogged from 301 in 2007 to 101 this year. In February 2008, when Sobti along with four colleagues from ABN AMRO Bank joined it, IndusInd was going through a tough phase. Net non-performing assets, or NPAs, had crossed two per cent of net advances, against the industry average of less than one per cent. Cost to income ratio was 70 per cent, and net interest margins were at a low of 1.34 per cent. Sobti restructured the lending book, introducing risk-based pricing of loans for companies - charging risky firms, typically small outfits, higher interest rates. He also launched several products in consumer finance, and tapped new customers by doubling the number of branches and driving for more fee income while maintaining the quality of assets. Today, IndusInd's net NPA is 0.34 per cent of net advances, and cost-toincome ratio has dropped to 48 per cent. Revenues have grown from Rs 1,500 crore in 2006/07 to Rs 3,589 crore in 2010/11. "The target for the next three years is to build scale and retain profitability through better execution and zero error tolerance," says Sobti. At Opto Circuits (India), Chairman and Managing Director Vinod Ramnani figured out that acquisition of companies abroad with proven technologies and products was the key to growth. He had started Opto in 1992, supplying sensors to companies such as Philips and General Electric. The first major break came in 2002 when Opto bought US-based Palco Labs, which gave it access to the non-invasive patient monitoring devices segment, a category that today accounts for over 80 per cent of its revenues. In 2006, it acquired Germany-based Eurocor to get into invasive devices such as stents and balloons. It has acquired six companies in the past three years. "We are competing with multinationals.... If I start developing products from scratch, it will take enormous time, money and multiple rounds of regulatory clearances.... Buying established businesses makes a lot more sense," says 55-year-old Ramnani. In 2010/11, Opto posted net profits of Rs 369 crore on revenues of Rs 1,586 crore. Twenty years after liberalisation, PSUs continue to hog the business landscape. Head starts in business supplemented later with incentives to perform have made for a potent combination. Add to that monopoly or near monopoly in select areas. Some PSUs missing from BT500 could well have made the cut if the government chose to sell its holding in them. 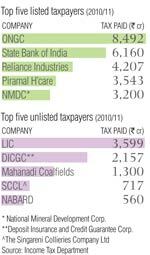 A look at the top 50 corporate taxpayers for the financial year ended March 31, 2011 shows the extent of PSU dominance. Three of the top five taxpayers were PSUs. Remove Piramal Healthcare, which shot up the ranking on account of a one-time income, and four of the top five are PSUs. No less dramatic has been the rise of Shriram Transport Finance Company, or STFC. Even seven years ago, despite having spent nearly twoand-a-half decades in financing new and second-hand trucks, it was struggling to raise debt from banks, which were wary of the sector. But with some deft moves it has been able to rise from 210 to 82 in the past five years. "A large part of our Rs 4,000-crore asset base was funded by fixed deposits and non-convertible bonds," says Managing Director R. Sridhar. "The business was perceived as risky." 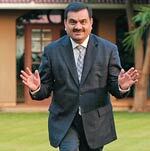 Then, in 2004, STFC roped in Arun Duggal, a former India CEO at Bank of America, as its Chairman. The next year, Delhiheadquartered private equity, or PE, firm ChrysCapital picked up a stake for some Rs 100 crore. That was followed by US PE giant Texas Pacific Group making a $100-million investment in Shriram Holding (Madras), which owns 45 per cent in STFC. The confidence shown by the PE firms attracted banks, which began lending to it more freely. Currently, almost 85 per cent of STFC's asset base of Rs 35,000 crore is funded by over 70 banks and financial institutions, a far cry from the dependence on deposits and bonds. Its financing portfolio has risen from 200,000 vehicles in 2005 to 1.2 million. Not all companies on this list have consistently climbed every year over the past five years. A few like CRISIL, the Indian arm of global ratings major Standard & Poor's, have had a patchy rise to the top. Says Roopa Kudva, CRISIL's CEO and Managing Director: "The rise is mainly a result of our entry into the global industry research market, and into new segments such as equity research and ratings of small and medium enterprises." A single individual has transformed the performance of Keralabased South Indian Bank, or SIB, which has jumped from 433 to 287. SIB was growing steadily but unspectacularly till 2005 when the executive board appointed V.A. Joseph as CEO and Managing Director. At the time, just two states, Kerala and Tamil Nadu, accounted for 75 per cent of SIB's business. Joseph spearheaded an expansion into several other states in areas such as SME and agriculture lending. "Many states on which we are focusing now are SME hubs. We have a strong product portfolio for the SME sector," he says. SIB's revenues have grown from Rs 977 crore in 2006/07 to Rs 2,446 crore in 2010/11. "The aim is to achieve Rs 75,000 crore asset base by 2013," Joseph adds.